Single family and semi-detached homes are complimented by a large concentration of City Housing townhouses. City Housing has become more involved in the community development and providing support to this neighbourhood. September 2012 - McQuesten presented their McQuesten Neighbourhood Action Plan (PDF, 10.3 MB) to Hamilton City Council for endorsement. The plans serve as a focal point for planning teams, but also continue to garnish the interest of other stakeholders from across the community. 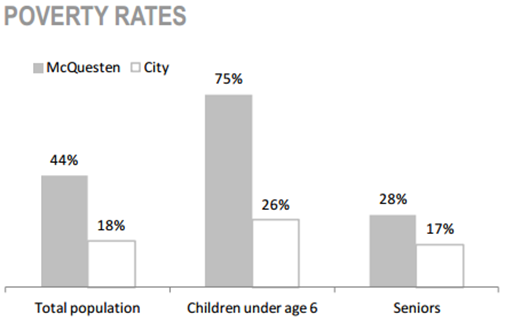 Children are a large part of the McQuesten neighbourhood, with about 31% of the population younger than 20 years old. 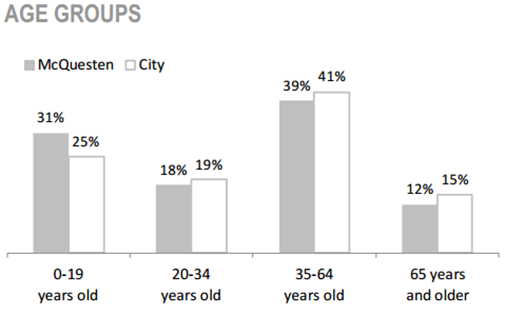 There is a smaller proportion of seniors in McQuesten compared to the city (12% vs. 15%). The profile of families with children in McQuesten is nearly opposite to the profile for the City of Hamilton. 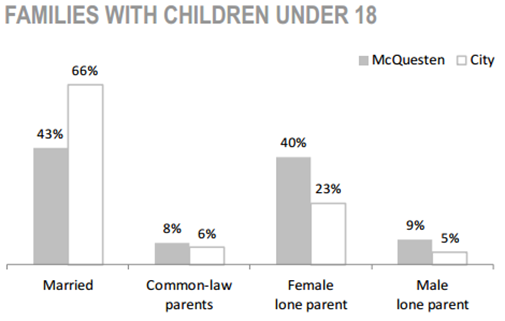 While two thirds of families with children in the city are married and almost one quarter are led by female lone parents, in McQuesten these categories are almost equal (43% are married, 40% are led by female lone parents). The proportion of single dads is almost double in McQuesten as compared to the city (9% vs. 5%). There is double the proportion of residents who have Aboriginal ancestry in McQuesten. More than one in five (22%) of McQuesten’s residents identify with a visible minority group, higher than the 14% rate for the city as a whole. McQuesten has a higher than average rate of newcomers to Canada among its residents. 10% of McQuesten’s population arrived in Canada between 1996-2006, compared to 6% of Hamilton’s population. Three in ten McQuesten residents live with an activity limitation. Almost six in ten homes in McQuesten are rental units. Home owners are a large group as well, representing 41% of McQuesten’s dwellings. Housing affordability rates are almost exactly the same between McQuesten and the city as a whole. Affordability for renters is better in McQuesten than for the city, which is due in part to the social housing stock that forms a significant part of the neighbourhood. Residents are slightly more likely to live in the same home as one year ago in McQuesten than the city as a whole. 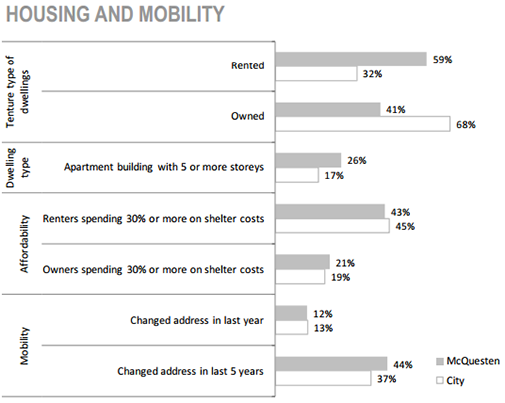 But a higher proportion of residents in McQuesten have moved after five years, as compared to the city (44% vs. 37%). McQuesten’s child poverty rate is 75%, almost triple the rate for the city as a whole. The difference between the senior poverty rate in McQuesten and the city is much smaller: McQuesten’s senior poverty rate is 28% compared to 17% for the city as a whole. 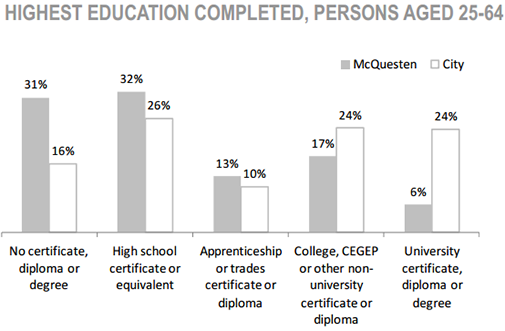 Among the population aged 25-64, 16% of Hamiltonians have less than high school education, whereas the rate is almost doubled in McQuesten (31% have no certificate, diploma or degree). In this same age group, one in five Hamiltonians has a university degree, but only one in 16 McQuesten residents has completed university education. 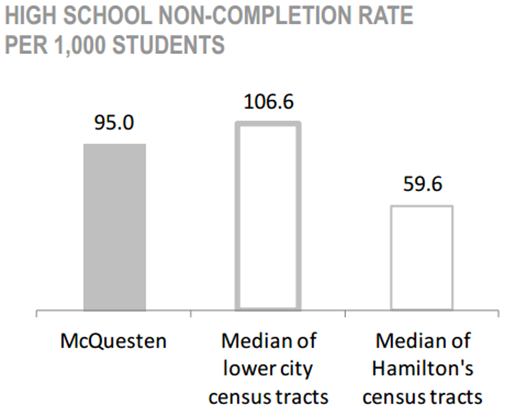 McQuesten’s rate of high school noncompletion is more than 50% higher than the median for all of Hamilton’s census tracts, but slightly better the median for the lower city. 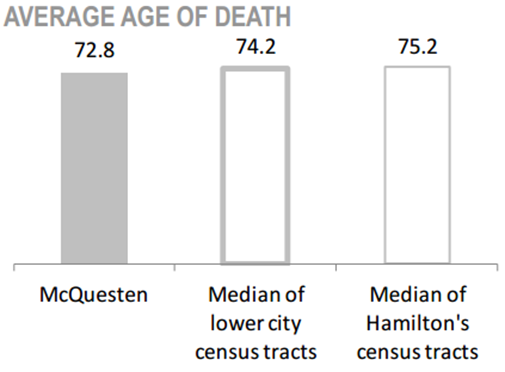 The average age that McQuesten residents die is 72.8 years, 2.4 years less than the average age at which city of Hamilton residents die, and 1.4 years less than in the lower city. 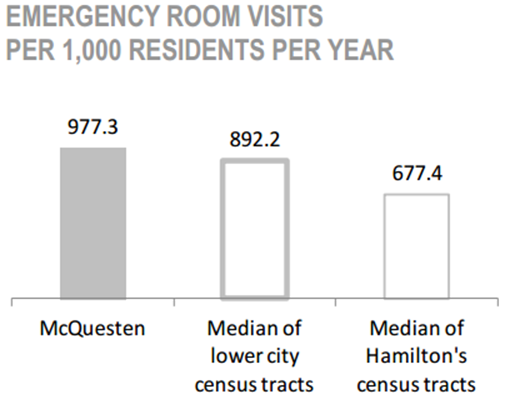 On average, there are more than 300 additional emergency room visits per year by every 1,000 McQuesten residents, compared to the city as a whole. 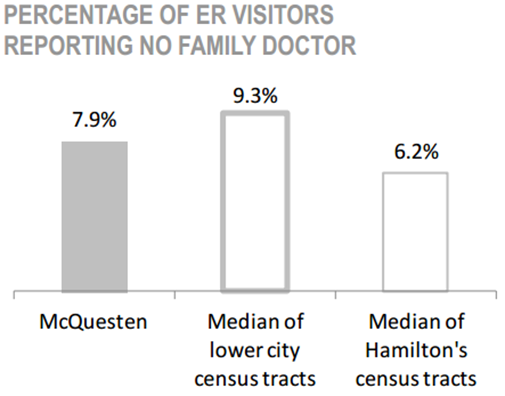 Among McQuesten residents who visit a hospital emergency room, 7.9% do not have a family doctor. While this is higher than the median rate among the city’s census tracts (6.2%), the McQuesten rate is much lower than the median rate for census tracts in the lower city alone which is 9.3%.